Disney Channel’s newest they’re-all-grown-up revival, Raven’s Home, returned with its second season earlier this summer, and I hope everyone is watching it. As true as all those things are, the main reason I hope every twenty- and thirtysomething reading this is watching Raven’s Home, which features That’s So Raven’s Raven Baxter (Raven-Symoné) and her best friend, Chelsea Grayson (Anneliese van der Pol). as divorced single moms moving in together to co-parent their three kids, is because as far as linear television goes, it is one of the only sitcoms currently in production that positions adult female friendship as a central premise. Replace the presumed “misadventures of singledom” with “active parenthood” in the friendship equation (sorry, Younger; sorry, Broad City; sorry, I guess, Big Bang Theory), and that one of qualifier disappears: With the excellent Playing House canceled in 2017, Fresh Off the Boat not centrally about Jessica and Honey’s friendship, and Fuller House only available on Netflix, Raven’s Home is linear television’s lone beacon for anyone who wants to laugh at the slapstick antics of adult women whose best friendship is as central for them as their kids are. You can reverse these qualifiers and get the same result: As far as sitcoms about moms who are also complex individuals with close female friendships outside of their family are concerned, there’s really not much available. If you are a mom on a sitcom, you are either only a mom(/wife)—see The Middle, The Goldbergs, black-ish, American Housewife, Modern Family, Speechless, Stuck in the Middle—or your kid is only around whenever a kid-shaped plot device is needed—see Younger, Parks & Recreation, The Mindy Project. (A similar hole exists for dads, which is just one of a dozen reasons losing NBC’s short-lived Champions was such a blow.) CBS’ Mom stands out as its own thing, as all the moms in the Plunkett line have plenty going on outside of their own momhood, but their deepest non-romantic relationships are still with one another. Disney’s great Andi Mack gives the younger of its two central moms some flexibility outside her momhood, but even then, that flexibility is really just for (possible) romance. If literally anyone is interested in seeing moms who work hard to maintain their own interests and friendships outside of motherhood cathartically sent up in a sitcom, Raven’s Home and Fresh Off the Boat are all that linear television is ready to offer—and again, of the two of those, only Raven’s Home makes its friendship between moms one of its defining characteristics. At the same time, as much as I endeavor to treat all the best Disney series as if they belong in the same conversation as their adult counterparts, Raven’s Home is still a show on the Disney Channel, made with a Disney Channel audience in mind. That is, kids. That is, not the group of people for whom watching two grown women pause from excitedly scrubbing out their shared tub and toilet on a Saturday morning, marvel at the mundane trajectory of their lives, then float the idea of Going Out (“Like—tiny purse Going Out? ?” “Like NEW WEAVE Going Out!”) will be at all entertaining, let alone specifically relatable. And yet, there are Raven and Chelsea, brand new scrub brushes in hand, at the top of “Adventures in Mommy-sitting” in Season One. Sure, Disney had the nostalgia and talent to get Raven’s Home greenlit, but it didn’t have to keep Raven and Chelsea’s adult friendship—and, by extension, recurring, remarkably nuanced, and highly specific comedic bits about rent, utilities, errands, PTA participation, parenting styles, and the emotional aftermath of different kinds of divorce (Raven’s first love, Devon Carter, is now her ex-husband and amicable co-parent, while Chelsea’s husband cheated on her, stole her life savings, and ended up in prison after being convicted of fraud)—as a central feature. In fact, the precedent to do otherwise had already been set: Girl Meets World, the nostalgia property that preceded Raven’s Home and arguably kicked off the current 1990s sitcom reboot trend, rarely let its adults take center stage, despite the fact that Corey and Shawn’s friendship was just as much a focal point in Boy Meets World as Raven and Chelsea’s was in That’s So Raven. That revival instead used its nostalgic friendship superpowers to bolster the relationship between teen leads Riley (Corey’s daughter) and Maya, only sporadically featuring Shawn as a prominent part of Corey’s adult life—and even then, mainly as an extension of Riley and Maya’s story. Corey and Topanga’s healthy marriage was there, as, eventually, was Shawn’s precarious relationship with relationships, but at the end of the day, it was always The Riley and Maya Show. 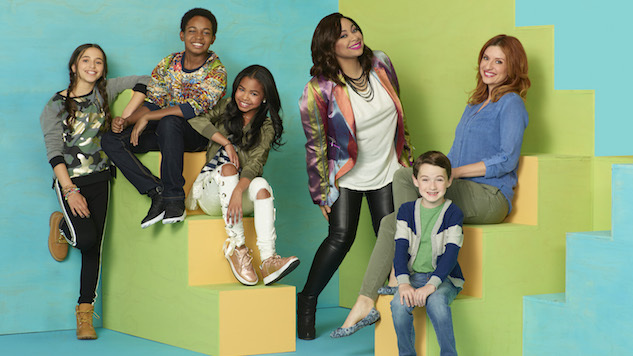 That Disney trusted enough in the strength of Raven and Chelsea’s friendship to eschew GMW’s kid-forward tack and give the adult BFFs of Raven’s Home equal (and equally slapstick) attention as Nia, Booker, Tess, and Chelsea’s son, Levi (Jason Maybaum), is a testament to the charisma Raven-Symoné and Anneliese van der Pol bring to the table, and to the comic gold that adult female friendships not centered on the misadventures of singledom can produce. Like I said at the top, I hope everyone is watching Raven’s Home, and that this entire column was just me preaching to the slapstick-loving choir. But I don’t need Raven’s (or Booker’s) psychic visions to guess that for much of the audience who would most appreciate this Disney-produced show’s specific—and currently singular—strain of lady humor, Raven’s Home has not pinged significantly on your TV radar. Let this be your ping: If you’re a person who likes funny women, female friendships, or plain old expert physical comedy, Raven’s Home is the most fun sitcom you’re not watching. Raven’s Home airs Fridays at 5 p.m. on Disney Channel, and can be streamed anytime on the Disney NOW app.